We love to find and collect old views that feed our curiosity and tell us something about the place we live. 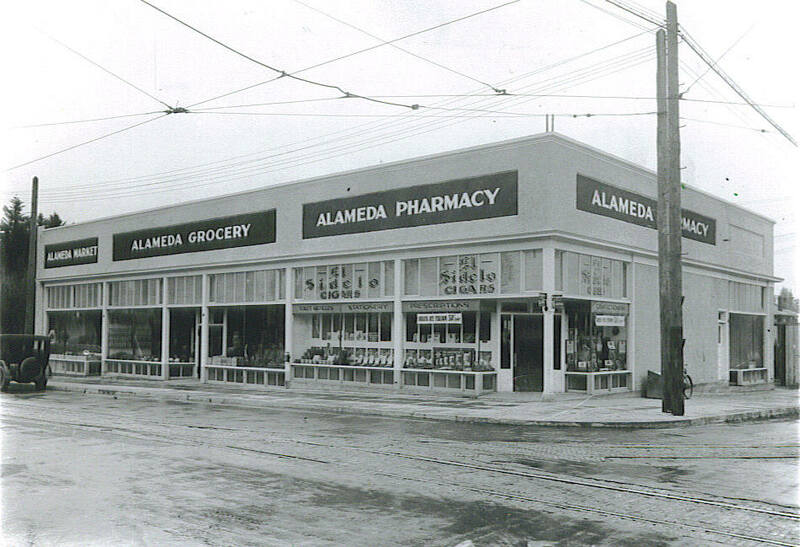 Today’s post assembles photos we’ve retrieved recently from a few archives that allow a look at changes at NE 24th and Fremont, which has always served as a kind of gateway to Alameda Park. 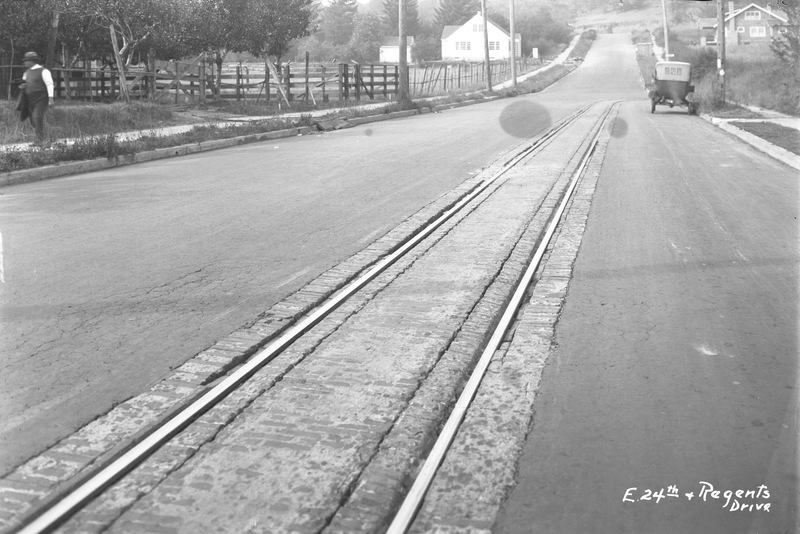 This image is labeled “PRL&P tracks, September 1921.” Like so many of the images at City Archives, it was taken to document the engineering, in this case the road and track condition. Maybe it was those bricks adjacent to the track that look sunk and a hazard for car tires. Or maybe it was just documenting the street scene before other work began. PRL&P was Portland Railway Light and Power: they ran the streetcar system and were in frequent cooperation and conflict with the city about infrastructure. The brickwork bordering the rails is a signature of the system. These days you can still see the rails during street maintenance or sewer construction, like just up the hill from here in 2014. Look carefully here and you can see the tracks round the corner at Regents and head east and up the hill. Your first thought as you look at this might be that the down slope from Fremont north to Regents is not quite that steep. But go stand and look at it and you realize that it is. The focal length of the lens and the absence of houses along the street trick the eye. An Alameda elder we interviewed a few years back told us that when he was a mischievous teenager in the mid 1940s, he once released the brake on a momentarily parked streetcar waiting at 24th and Fremont (the driver had gone into the pharmacy to use the facilities) and the streetcar absolutely knew there was a slope: it drifted driverless down from Fremont and made it most of the way around the corner on Regents before its gravity was spent. Both houses pictured here are still place, the one on the right is 3808 NE 24th built in June 1921. On the left, 3803 NE 24th, which was still under construction in the fall of 1921 (is that a for sale sign out front?). 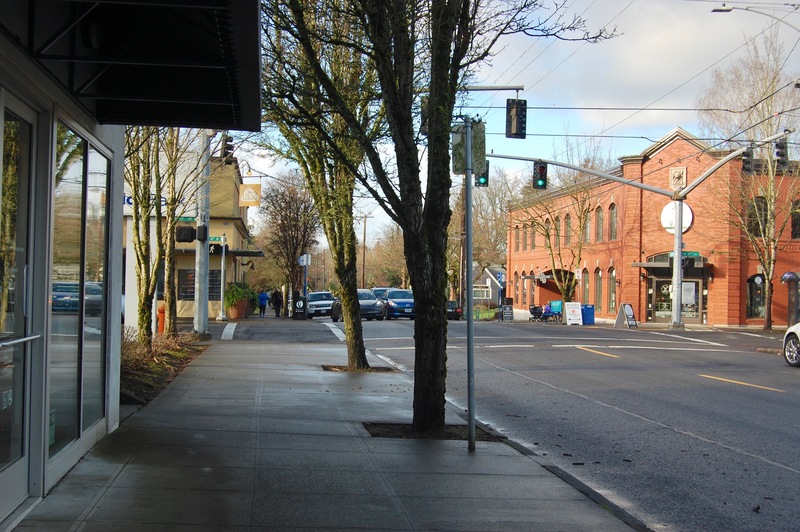 The cutbank you see at the end of the street is where Ridgewood, running east-west, cuts along the Alameda ridge. In the foreground to the left you can see planks placed over the curb that allow a tractor or wheeled vehicle to turn into the farmyard, which looks like it includes a small orchard. This open stretch of land was pasture for cows and orchards, as we learned recently about the adjacent Homedale plat. Here’s another favorite shot, from not too far away from our first photo, looking to the southwest, today’s Lucca and Garden Fever. We wrote about the life of this building a few years back. Check it out. Looking southwest at the corner of NE 24th and Fremont, early 1920s. Note delivery bike visible behind power pole. OrHi 49061. These next two are pretty amazing. They’re from City Archives and our guess is they accompanied the building permit request associated with construction of the building that now houses Alameda Dental and Union Bank, which was originally a Safeway. You can read more about that in the post we mentioned earlier, which includes a drawing of that building from its grand opening. 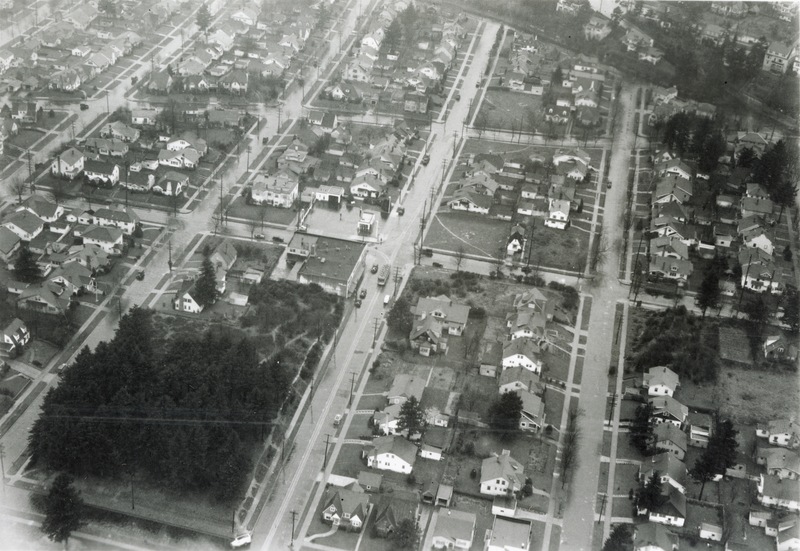 1935 Aerial of NE 24th and Fremont A2205-05.1421.2. Courtesy of Portland City Archives. Click to enlarge. There’s so much here to observe and wonder about, it’s hard to know where to start. 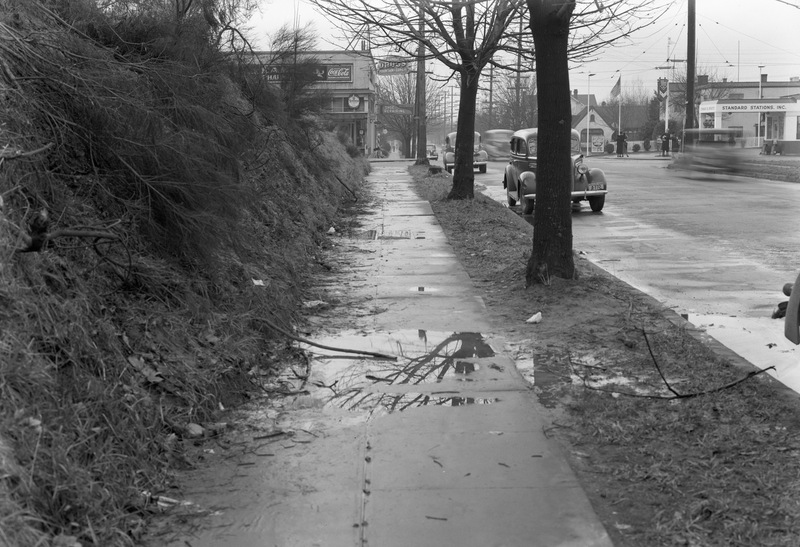 This is 14 years after the first image in this post, and you can see both houses on NE 24th pictured earlier, and clearly locate the path of the Broadway Streetcar. In fact, look close and you can see the actual streetcar stopped there at 24th and Fremont. Check out the notable empty lots, and how about that forest where the Madeleine soccer field is today? A billboard put up on the corner at 25th probably advertises property for sale. The filling station at 24th and Fremont. A few people out walking. A sharp eye will locate the Eastman House on NE Stuart Drive. What jumps out at you? The same view in December 2018. This 1938 image looks like it was taken from about where the front door of Alameda Dental is today. The elevation of the vacant lot to the left and its brushy slope is amazing. The building that today is Lucca—Alameda Drugs—sports the signs for Sunfreze Ice Cream and a pay phone, and the delivery bike is still there. Down the line is the shoe repair shop of John Rumpakis, a barber shop, and the stairs that lead up to the dentist on the second floor. Across the street we have the Standard Oil service station that operated up into the 1970s and some people waiting for the Broadway streetcar. 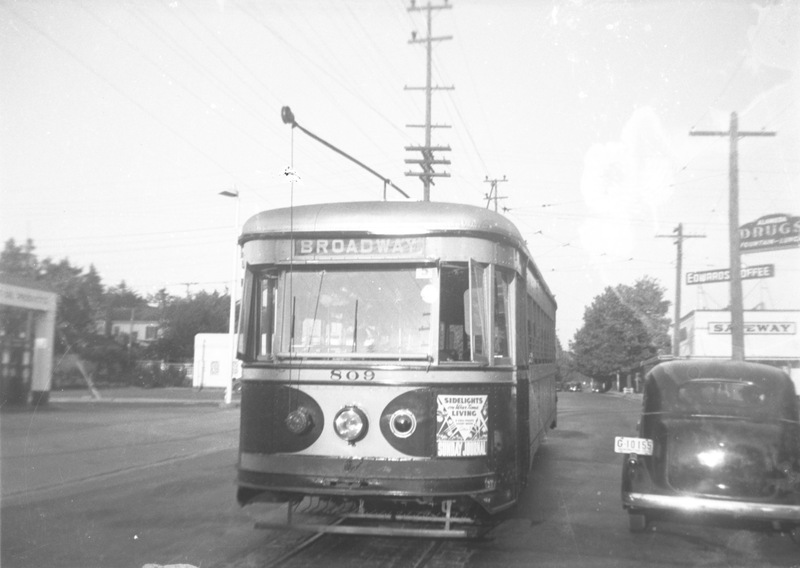 Speaking of the streetcar, here’s another image we found, taken at this intersection in 1940. Broadway line car 809 rounds the corner at 24th and Fremont, looking east, 1940. Courtesy of Portland City Archives A2011-007.65. In this shot we can see the corner of the Standard Oil station in the far left; a new building in the lot on the northeast corner—partially hidden by the streetcar—where Childroots Daycare is today (which was a Hancock Gasoline station up until the mid 1970s); the new Safeway building that had just been built; and the sign mounted to corner of Alameda Drugs. No telling if the delivery bike is still there. Do you have a photo of this intersection or memory you’d like to share? We’re always on the lookout. Wow! These are amazing. Thanks for sharing! John Laurence here—retired from the Forest Service and writing to tell you how much I enjoy your blog! We live just north of Ainsworth on 22nd so are in your neck of the woods. We are active with the Woodlawn Neighborhood Association—we’re the eastern outpost of Woodlawn. WNA will be sponsoring a Woodlawn Trivia Night at the Oregon Public House in January so keep your eyes peeled—I bet you will clean up! Hi John. I’m glad you are enjoying the blog and have dropped you a note in reply. Ahh..the Broadway streetcar. We lived on Hancock between the two tracks, 24th and 22nd. My brother still has a chipped tooth from getting his bicycle tire caught between the bricks and rail. We used to pull the trolley off the wire to be ornery. Now in our 80’s, love to look at the pics. During the pave over of the tracks we as kids sat on the curb and cried. Thanks for sharing that memory, Del. I’d love to learn more about your recollections of the streetcar and have dropped you a note. Rode the Broadway cars and really appreciated the newer cars such as in the above picture. They rode much better, quieter and the motorman had a place to sit other than a drop down stool. I delivered to this Safeway in the early 50’s, always in the early AM through a locked back door. There was a cage to be sure we did not get in very far.